Wizards are scientists and engineers who have codified the complex relationship between Animus and Mana into a set of rules for consistent and uniform behavior. The Laws of Wizardry are in essence, the language of "Magic." At least magic as it is viewed by the layman. Language in all forms, including written in the form of Runes, spoken Invocations and action in the form of Gestures are powerful tools to focus and concentrate the mind and thus manipulate the forces of nature. Further, certain material objects and constructs have natural or man-made affinities to natural forces that helps in channeling these forces. Taken all together, Runes, Invocations, Gestures and Catalysts are tools that allow Wizards to control the very world in which the live. Wizards "cast" spells, which are actually complex formulas for the manipulation of the elemental forces of nature through the application of both Animus and Mana. As discussed in the section on Mana, there is significant interplay between Mana and the elemental forces. Properly trained, a mage can utilize his own Animus to accumulate, contain and manipulate Mana in order to control elemental forces. Sorcerer: Element of Water. Sorcery is the magic of information and scrying from a distance. Sorcery also deals with any spells using water and liquids. Enchanter: Element of Air. Enchantment is the magic of illusions and charms, of beguiling the mind. Enchanters also specialize in any spells involving air and gases. Thaumaturgist: Element of Earth. Thaumaturgist deal with spells of a physical and earthly nature, healing, mending and spells dealing with the ground and earth itself. Pyromancer: Element of Fire. Pyromancy is the magic of fire, light and energy. Usually spells of a destructive nature, pyromancers channel fire and light. Conjurer: Element of Spirit. Spirit is animus, the element of life. 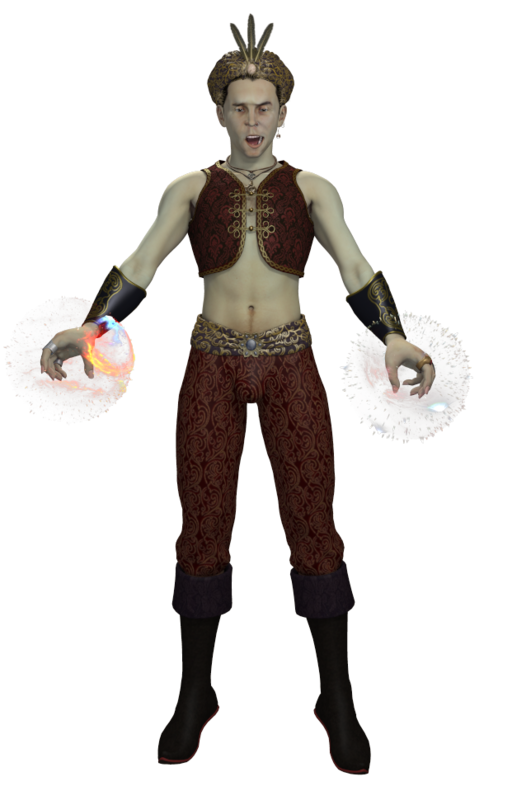 Conjurers deal with spells that summon beings both magical and mundane. They also use spells that directly affect the spirit or soul of a living creature. While conjurors conjure animals and spirits, they are most known/feared for conjuring demons. Necromancy: Necromancy is the only exception to the rule allowing a wizard to specialize in only one element. Necromancy is a hybridization (some say abomination) of Conjury and Thaumaturgy. It combines Earth Magic and Spirit Magic to do vile and unspeakable things, such as animate the dead, control and converse with undead creatures and even occasionally do what only priests can do, bring the dead back to life (this is only done rarely, since it usually is contradictory to the nature of the Necromancer, unless he/she intends to try and enslave the one brought back).